Since Facebook went public, they’ve been trying to make a transition. They started as a site with its core centered firmly in a free service that replicates electronically the connections we have in “real life.” They now need to be a site centered in what the shareholders want: money. One of the primary ways they’ve done that is with what I’ll call “Facebook ads”—but is broader than just ads. It’s the various ways a business (or individual, but let’s stick to business) can promote itself. This includes paying to “Boost Post” or paying to “Promote Page” in addition to using the Facebook Ads Campaign Manager or posting Offers. However you want to do it, you’ve chosen to drop some money in Facebook’s pocket for some extra exposure to new (or existing) people. You go through the steps to let them know the audience you’d like to reach. You send them the cash, and they promote you to the right people. Or, at least that’s how it’s supposed to work. 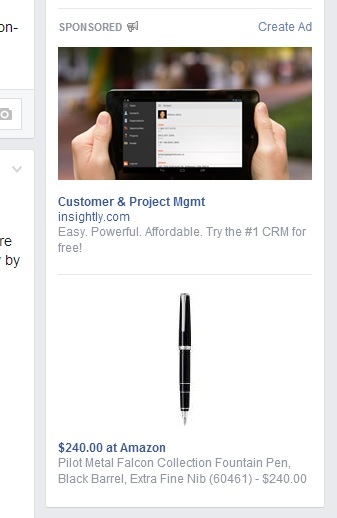 But there’s one problem with Facebook ads: they’re not that smart. Seems like they’re targeting pretty well. I’ve been talking about having started a business recently, so the Customer Relationship Management (CRM) site Insightly.com is a good bet. I’m also a big fan of fountain pens, so the Pilot pen is a pretty good match for me. Not only that, but Facebook has shown me those ads not just based on a guess, but based on web data collected behind the scenes. These are exquisitely tailored to me in particular because I’d been talking about both in private messages on Facebook. 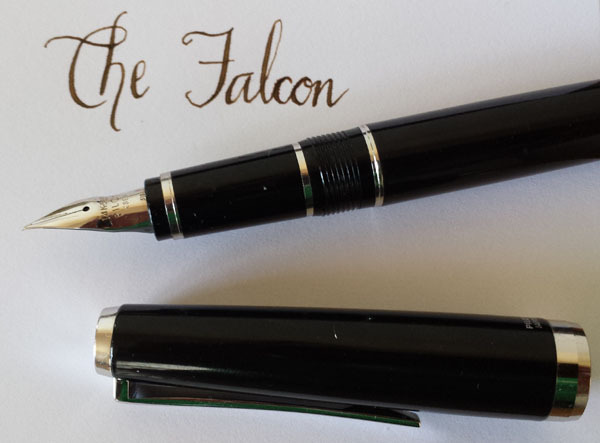 Yes, and not just a Pilot fountain pen, but the Pilot Metal Falcon, Extra Fine Nib, with a black barrel. Gratuitous pen shot. The soft nib allows variation in line thickness based on pressure. In other words, I’m a false positive for an ad match. I’m all about solutions, not just complaining about Facebook and showing off my lovely pen. Here’s what you can do to avoid wasting money: measure your return on investment (ROI). Set up your ads so that you can tell which ad or campaign it came from–for example, give it a unique name, or if you’re using Google Analytics, be sure to use UTM tagging on your link. That way you have a chance at seeing how many people came to your site because of the ad. Depending on your tracking options and the goals for the ad, you should be able to determine how many of that set of visitors ended up converting. (A conversion could be buying, creating an account, downloading, subscribing, watching a video, or whatever action you are looking for). Then you can see whether the cost of getting that conversion was worth what you paid for it. And here’s the best part: whether it was worth it or not, it doesn’t matter how many of the people who saw it were false positives. If Insightly got enough paying members because of that ad that it was profitable to do so, it doesn’t matter if there were 10,000 false positives in addition to me. The end result is the same: profit. On the other hand, if Amazon finds that they didn’t sell enough pens with their campaign, it doesn’t matter if I was the only false positive out of 10,000 people. It still wasn’t worth it. The moral of the story, then, is twofold: First, you should know that Facebook ads sometimes (often?) are shown to inappropriate targets. Second, if you set up your ad campaign and web tracking correctly, the first item can be safely ignored. If you have specific questions related to this, please feel free to contact me and I’ll do my best to answer them.